Recently remodeled condo at The Landing. Ideal location! Location! Location! Location! This unit is part of The Landing Condominium Complex and is located just off Highway 7 on the main channel of Lake Hamilton. 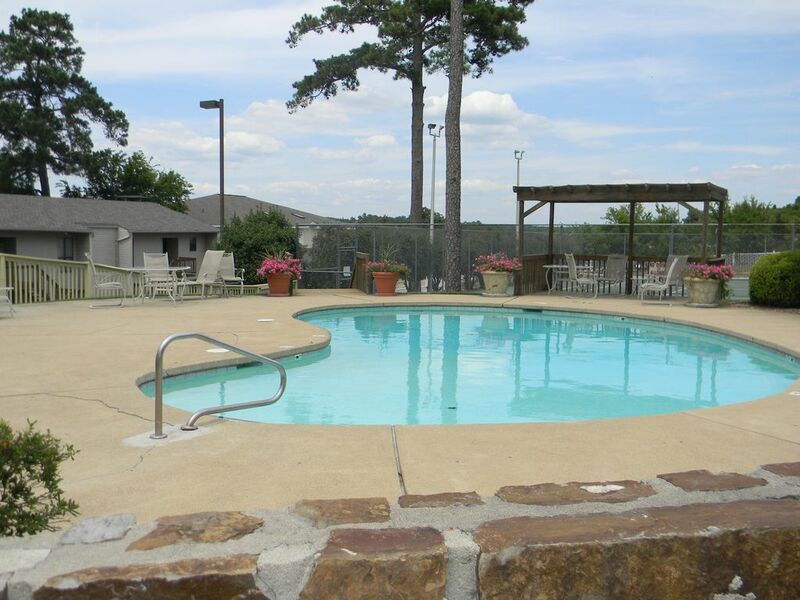 It is very easy to find and close to Hot Springs attractions and amenities including Oaklawn! Short walking, driving or boating distance to many restaurants, marinas, shopping, nightlife, etc. Unit is not directly on the water as it sits in the second row of buildings but has a partial view of the lake from the balcony. Unit is on ground floor on parking lot level so no steps to negotiate! While not on the water, it is directly adjacent to the pool and tennis court, which is not the case with the waterfront buildings. Complex provides direct access to the lake with a gazebo for common use. Boat slip not included but can be made available upon request. The condominium is approximately 1100 square feet with two bedrooms and two full baths. It was fully remodeled and refurnished in April 2015. The master suite has a king bed, vanity area, full master bathroom with tub/shower, 48' flat screen television, double closet and sliding door access to the balcony. The guest bedroom has one king bed with full sized closet and a 48' flat panel TV. The kitchen has modern appliances including microwave, washer/dryer, dishwasher, cookstove, Keurig coffee maker as well as being fully equipped with all cookware, dishes and utensils. The living room has a 50' flat panel TV as well as a beautiful view of Lake Hamilton and the incredible sunsets. The 24' covered boat slip is a couple hundred feet from the unit, however, guest parking is available near the slip. The Landing is a gated condominium complex with a swimming pool, tennis courts and ample guest parking. A gazebo on the water is available to guests for fishing, picnics, or just watching the lake activities. Holiday fireworks displays can be seen from property! Many vacation rentals on Lake Hamilton are not easy to get to, don't have a view of the main channel of the lake and are not close to all that Hot Springs has to offer. This unit has all this and more! Steve Mallett Currently live in Russellville with three girls. Lived in Hot Springs from 2002 to 2012. This property is a ground floor with direct access from parking lot. This unit is adjacent to the pool and tennis court and is perfect for families with kids or for folks who can't negotiate the steps at most of the other units in the complex. While it is not directly on the water and has a limited view, it still provides access to the lake and has other advantages that the waterfront units don't. The location of the property is what sold us on buying in this complex as it is close to all that Hot Springs has to offer. We were also impressed with the property manager and the condition that the grounds and buildings are kept. Very short boat ride to Fisherman's Wharf, Back Porch Grill, Boathouse Restaurant, the Belle of Hot Springs and several other restaurants, which we really enjoy. Sits in the second row of buildings, so not directly on the lake but can see Lake Hamilton from Balcony. Lake access on property. Boat slip available. Wireless Internet provided. Recreational only. May not be suitable for intense streaming use. While not fully wheelchair accessible, it is parking lot entry with only a curb to negotiate to get to front door. We have stayed at The Landing a couple times, just in different units. This one is clean and well kept. Two king beds that were very comfortable. My family enjoyed their weekend. Hope to visit again soon. Location is great! The condo is partially remodeled, flooring and paint, some light fixtures. We chose to stay because of the location to the tennis court. The court is unplayable!!! This was a major disappointment for us!!!!! We play tennis daily and had to find a public court to play on, not an easy task. The guests in the condo above us were very noisy! We won't stay again. Comfortable beds and nice location. very enjoyable and great location!!! Our family enjoyed the stay and we will be back. Her comfortable and great location!!! Adjacent to marinas, restaurants, night clubs many of which are accessible by car or boat. Short driving distance to numerous local and chain restaurants as well as shopping malls and movie theaters. Located on Scenic Highway 7 which is the main highway traveling through Hot Springs. Travel north on Highway 7 and you will pass Oaklawn Park which has live horse racing from January through April and eventually end up in Historic Downtown Hot Springs and the Hot Springs National Park, where you can stroll downtown, shop at the boutiques, visit the steaming hot springs for which the city was named, enjoy a thermal bath and massage and complete your day with a visit to one of the fine dining establishments. You will also be minutes away from Magic Springs Amusement/Water Park, Garvan Woodland Gardens, Mid America Museum, the Gangster Museum and many other local attractions.